snowdeal.org > ex machina: the eric update - day 1086: odin meets dexter bean! the eric update - day 1086: odin meets dexter bean! 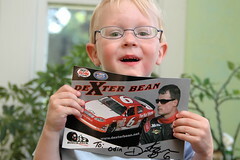 unless you follow arca racing or the nascar busch series you might not know dexter bean. but odin sure knows that he's a rookie racecar driver because dexter's team garage is on a regular driving route and many times a week parked in front of the garage we see a giant red semi-trailer that looks a whole lot like mack from odin's favorite movie "cars" that is used to haul dexter's cars to races. invariably, if dexter's semi is parked in front odin will exclaim, "look! look! dexter bean's racecar semi!" and if it's not there odin will likely ponder where dexter has gone, whether he's racing and the chances that he'll win. today when odin and his ever thoughtful mamma drove by and noticed that there were people milling about she stopped to ask is they might mind showing a very excited little boy around. a request they happily obliged! it just so happened that dexter himself was there and he showed odin that he could carry not one but two racecars in the truck which is something that he liked to do in case one didn't work. he got to see the cars up close and one of them even had scratches on it from running into the wall, which you can imagine is quite an exciting sight to see. he even got to talk with the mechanics minding and mending the motor, mighty motor, maker of motion ( a favorite phrase from his favorite book, "a racecar alphabet" )! and maybe best of all dexter gave his new buddy a card with his autograph on it. dexter, i do believe you have a new number one fan. thanks for taking a few minutes out to make a kid's day.